Advance was the first and most famous of four blockade-running vessels that the state of North Carolina operated in partnership with the Alexander Collie Company of London and Manchester during the Civil War. Originally a passenger steamer named the Lord Clyde that plied the waters between Dublin, Ireland, and Glasgow, Scotland, the ship was converted to a blockade-runner in 1863. After its first run into Wilmington, it was renamed the Advance, a name that would often be confused with the ship's sponsor, Governor Zebulon B. Vance. The vessel became one of the war's most successful blockade-runners, although its career in that dangerous business did not exceed 15 months. In early September 1864 the Advance, after running Cape Fear's New Inlet, was overtaken by the Santiago de Cuba, one of the Union's swiftest blockaders, and forced to surrender. Given to the Union navy and renamed the Frolic, the steamer was converted to a blockader and returned to the waters off Wilmington, where ironically it was used to intercept Confederate runners. Dawson Carr, Gray Phantoms of the Cape Fear: Running the Civil War Blockade (1998). Kenneth Wayne Robinson, "North Carolina's Blockade-Running Partnership: An Effort toward Self-Sufficiency during the Civil War" (M.A. thesis, North Carolina State University, 1973). Stephen R. Wise, Lifeline of the Confederacy: Blockade-Running during the Civil War (1988). "Advance (Blockade Running Steamer, 1863-1864)." Naval Historical Center. U.S. Department of the Navy. http://www.history.navy.mil/photos/sh-us-cs/csa-sh/csash-ag/advance.htm (accessed December 2, 2013). 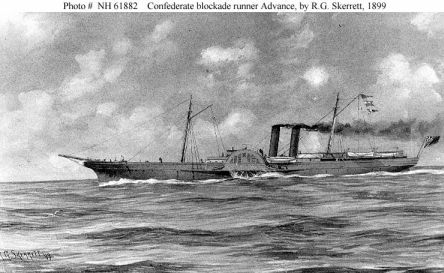 Confederate Blockade Runner Advance Sepia wash drawing by R.G. Skerrett, 1899. Courtesy of the U.S. Navy Art Collection, Washington, D.C. U.S. Naval Historical Center Photograph.Photo #: NH 61882. Available from http://www.history.navy.mil/photos/sh-us-cs/csa-sh/csash-ag/advance.htm (accessed May 14, 2012).